Vitacost, Your Online Shopping Buddy! You are here:Home » Vitacost Online Shopping » Vitacost, Your Online Shopping Buddy! More goodies just arrived at my doorstep! With priority shipping, my shopping at #Vitacost often arrived from USA in less than 2 weeks. 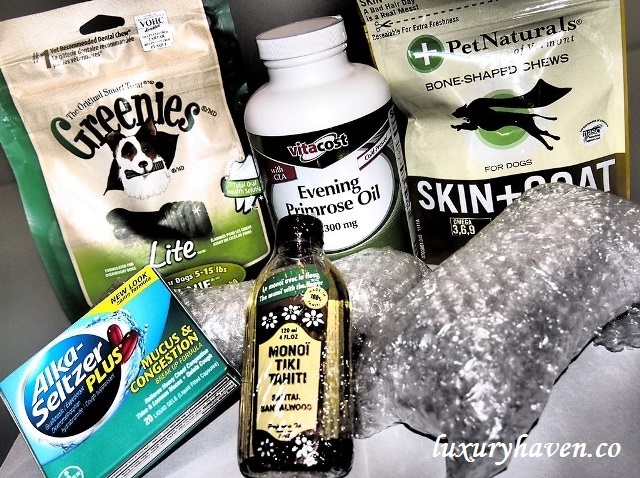 I like how some of the things I ordered from Vitacost are nicely sealed or bubble-wrapped like these few items. I’m addicted to body massage & have signed up for a package near my home. However, the beauty salon uses unscented oil & I've to pay extra for scented oil. 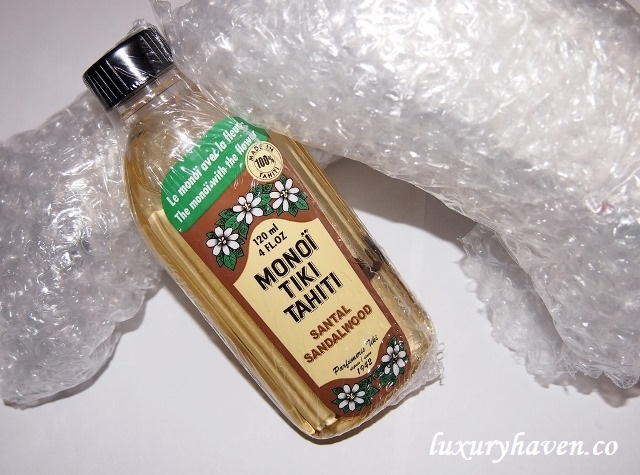 So I often use my own, & this Monoi Tiare Tahiti Santal Sandalwood Coconut Oil (4 fl oz) seemed like another good buy. I like #sandalwood for home fragrance, & finally found one I can use on my body too. Retail price: USD 11.50, Vitacost: USD 7.59, You Save: 34%!! Lemongrass - Retail price: USD 6.39, Vitacost: USD 4.69, You Save: 26%!! Sweet Orange - Retail price: USD 4.15, Vitacost: USD 2.69, You Save: 35%!!! 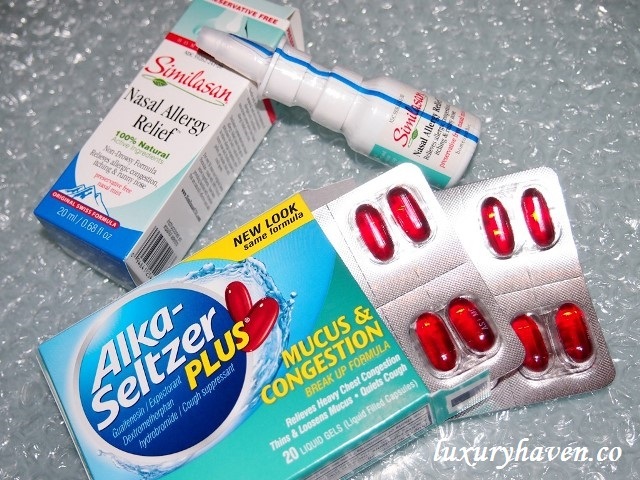 I’ve always found it easier to swallow capsules, so I’ve ordered the Alka-Seltzer Plus Mucus & Congestion (20 Liquid Gel Capsules). Retail price: USD 8.79, Vitacost: USD 7.49, You Save: 14%! Helps loosen phlegm (mucus) & thin bronchial secretions to rid the bronchial passageways of bothersome mucus & make coughs more productive. Temporarily relieves: cough due to minor throat & bronchial irritation as may occur with a cold the intensity of coughing the impulse to cough to help you get to sleep. My son often has runny nose, so I’ve also ordered the #Similasan Nasal Allergy Relief (0.68 fl oz). Similasan's preservative free Nasal Allergy Relief nasal mist gently stimulates the body's natural ability to relieve allergic congestion, itchy, runny nose & rhinitis caused by pollen, pet dander, dust & mold spores. Retail price: USD 8.99, Vitacost: USD 7.39, You Save: 17%! I’ve been taking Evening Primrose for the last 20 yrs, so when I saw Vitacost Evening Primrose Oil with GLA (1300 mg, 300 Softgels) @ USD 23.99, I thought it’s kinda good value, & decided to try this brand. How does evening primrose oil support health? 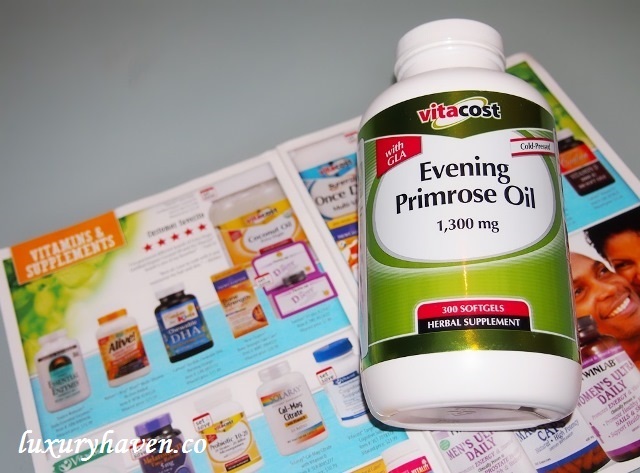 Why choose Vitacost Evening Primrose Oil? Supplies 1,300 mg of evening primrose oil per 1-softgel serving. Contains 300 servings per bottle. What happens if your dog can’t get enough of dog treats? Well, you just gotta order more!! 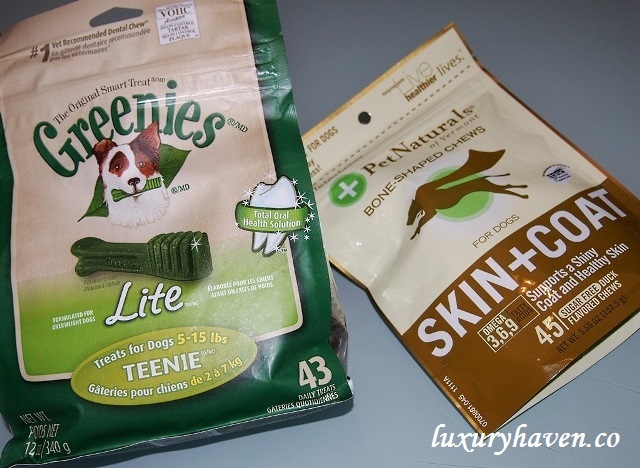 #Greenies Dental Chews LifeStage Lite Teenie Treats for Dogs 5-15 lbs (43 Dog Treats). Retail price: USD 20.99, Vitacost: USD 13.69, You Save: 34%! #PetNaturals of Vermont Skin & Coat for Dogs Duck (45 Soft Chews). Retail price: USD 13.99, Vitacost: USD 6.49, You Save: 53%!! What I enjoy shopping most at Vitacost is their monthly super sale with lots of discounted items! I’ve got mine; time to shop for yours too! Interesting buys! Never know that you could bring your own massage oil for massage section. How lucky of your dog - Candy, to get all kinds of different treats ever since you start shopping a Vitacost. DS, guess the beauty salons are more than happy we're bringing our own oils. Heehee! Lovely products, some which I have already been using. Will check the others, those that are new to me. 1300mg for EPO? Normally it is 1000mg.. been buying EPO since I was young... now my girl takes them regularly..
Nice that you are getting all the great buys from your internet shopping. Thanks for sharing that the store is having a great sale! Zoe, this is a great place for value buys! Have a wonderful week, sweetie! Ken, it's a very popular health supplement that great for the family. Parents like to buy for their kids especially if they suffer from dry skin condition like eczema. Uru, have fun checking out! You are a very smart lady who knows what is good for our bodies. I am a staunch and daily user of essential oils too. I buy them 100% pure extracts directly online from USA too. I started to do my own research to help both my aged parents who are in their 80s with weak limbs and multiple sickness. They have dozens of medications but none could help with their weak limbs. Now I apply the essential oils on them and it helped them to walk better besides giving them lots of energy through simple massage which will penetrate the oils inside. Lemongrass seems to work the best & miraculously for weak and aching limbs! I am always the guinea pig to test all the oils before applying on my parents. You are really a wise shopper and got yourself some good deals. hee, online shopping is the new trend! fast and convenient and not necessary expensive too! I've been looking all over for essential oils for candle making Shirley. I want a good brand that actually smells, lol...Do you know if these are good for candle making? 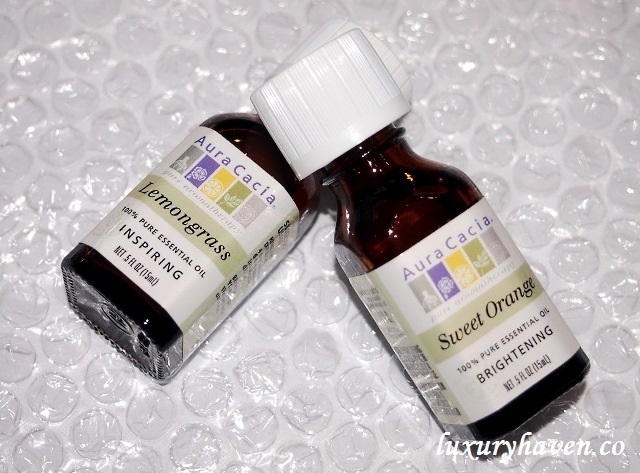 Some essential oils are better with a diffuser (cool mist) rather than using in candles. Louise, didn't know you're so talented! I've never tried candle making, so I'm afraid I can't suggest much. There're quite a variety over at Vitacost. Maybe you can check it out :) Do buzz me when you're finished with the candles. Would love to see them! Wow..lot of good products! From vitamins to pet treats..nice!